Hot Wings are the quentessential game day food. 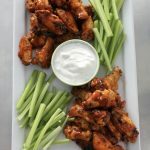 This recipe for Baked Hot Wings with Creamy Gorgonzola Dipping Sauce takes your Super Bowl celebration to the next level with spicy, sweet, cool and creamy all in one simple dish! Hot wings are popular appetizer menu items in restaurants and one of the easiest recipes you can make at home. Most hot wing recipes call for deep frying; my recipe for Baked Hot Wings with Creamy Gorgonzola Dipping Sauce are baked. I’m not into deep frying, mostly because I am not a fan of cleaning up or disposing of grease. Also, I have real issues with achieving the perfect temperature for deep frying. The oil always seems to be too cool or too hot, which equals deep fried disasters! And lets face it, while chicken wings are not especially healthy, baking is always better than deep frying if you’re looking to cut calories. -Prepare the sauces, one for coating the chicken,one for dipping. -Season and bake the chicken wings. I used Tony Chacherey’s More Spice Seasoning. -Drain the juice from baking pan, toss the chicken wings in hot sauce mixture. -Final quick bake to seal sauce onto wings. Now, for the real beauty of this recipe. The chicken wing potion of this recipe only calls for four ingredients. Four simple ingredients: Chicken Wings, Hot Sauce, Seasoning and brown sugar. You won’t believe how easy it is to make such an amazing appetizer. If you are short on time and want to make this ahead of time, Cut up the celery sticks the day before and store in a ziplock bag. Just before serving, place them in a bowl with a little ice water to crisp the celery up if you wish. Make the Creamy Gorgonzola Dipping Sauce ahead of time as well. When you are ready to bake the wings, all you have to do is concentrate on the chicken. Make sure to have plenty of napkins on hand! Whisk together the hot sauce and brown sugar in a bowl, set aside. In a separate bowl, mix together the sour cream, Greek yogurt, gorgonzola, salt and onion powder. Refrigerate until ready to serve. Pre heat oven to 375 degrees with oven rack on top third of oven. ( I use the third rack from the top). Place chicken wings on lightly greased rimmed baking sheet. Season generously with More Spice Seasoning or salt, pepper and paprika. Bake for 15-20 minutes or until chicken is done. Remove from oven. Turn oven to 450 degrees. If you have a convection setting, turn the convection setting on. Place the cooked chicken in a large bowl using tongs or a large spoon. Do not pour the chicken into the bowl as the juice from the chicken needs to be discarded. Pour about 1 cup of the hot sauce mixture over the cooked wings in the bowl. Toss the wings so they are coated with the hot sauce. Discard any juice from cooked chicken in the baking pan. After the chicken has been coated with the hot sauce mixture, place the chicken back on the baking pan, spoon a little more sauce over the chicken pieces and place back in oven for 5-7 minutes or until chicken browns bit. You may also turn the oven to broil and broil the chicken for just a few minutes instead of cooking at 450 degrees. Watch carefully so it doesn't burn! Remove from oven and arrange on a serving platter with celery slices and dipping sauce, and spoon additional hot sauce over wings if desired. -I purchase a 10 lb bag of chicken from Costco and use about half for this recipe. I like the Kirkland brand chicken wings which are labeled "first and second sections, ice glazed" -The chicken pieces may be baked frozen or thawed, if baked straight from the freezer unthawed, add about 5 minutes to initial baking time. -The More Spice Seasoning is not necessary, you may use any type of seasoning salt or Creole seasoning. -I recommend placing a small spoon in the dipping sauce so all of the sauce from the chicken does not end up in the bowl of gorgonzola dipping sauce.-You should have about 1 1/2 cups of sauce leftover, which you can save for another batch of wings! If you double this recipe, one batch of hot sauce should be enough.